At the WordPress Learning Center, we can help you with your theme and your WordPress site. You can get your questions answered in live, private classes with a certified instructor. Our instructors have worked on many, many different themes including both free and premium themes. Give us a call today fat 877-844-9931 for a free consultation so that we can get your site back on track! 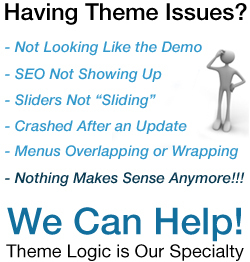 Click here to learn more about how we can help you with your WordPress theme!